Most Moto E owners needn’t access developer options most of the time. But occasionally, you may need to enable developer options to test some apps, or to run some ADB commands, or to try some monitoring tools. The most commonly used feature in developer option is enabling the USB debugging. Of course, you cannot find the the developer options on Moto E.
This guide shows you how to enable and use developer options on Moto E.
The main purpose of hiding the developer options is to avoid the accidentally enabling of these options. Some developer options, if not fully understood, may make your phone useless if you enable them accidently. There are many reports on such accidents. So, be calm down. It is normal if you cannot find developer options in your Moto E.
How to enable Moto E developer options? Tap the Build number field 7 times. You will begin seeing a message as you approach the 7 touches as shown below. Tap the back arrow once complete. Now you enabled developer options on Moto E! You can start to access Moto E developer options. On Moto E, you only need enable the developer options once. Once unhidden, it will be always available unless you perform a factory reset for the phone. How to access Moto E developer options? 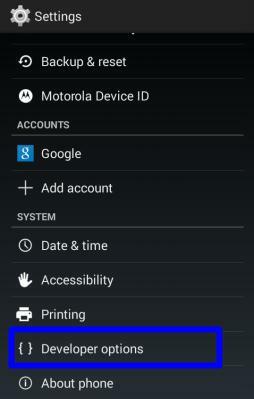 Once Moto E developer options are enabled, you can access all the options in Settings–Developer options. For example, you can easily find the USB debugging option. Please note, you should enable the options only when you fully understand them. When you finish your debugging, it is a good practice to disable/turn off the Moto E developer options immediately. You can tap developer options under settings, then drag it to left to disable/turn off the Moto E developer options. This will avoid any accidental operations. Can I hide Moto E developer options again? The short answer is no. As mentioned earlier, once the Moto E developer options are unhidden, it will always be available in the user interface. You can turn off/disable developer options on Moto E by drag the switch to left. but, you cannot hide it again unless you perform a factory reset. Do you have any problems to enable and access the Moto E developer options? Please let us know your questions/problems in the comment box below. What’s the OS of your PC? Normally, you don’t need to do anything and your Moto E should be recognized automatically once connected to the PC through the USB cable. U must have a data cable. Did you mean you can’t reboot the phone? How do i restrict to show ONLY the contacts with Phone Numbers in the “People” app ? My phone is connect to my gmail account and it shows the 1000s of contacts from my gmail account, which i don’t want. I want only the contacts either from my SIM or show only gmail contacts with phone numbers. You can organize contacts in different circles. By default, the people app shows contacts in My Contacts. In people app, tap “contacts in xxxx@gmail.com“, then tap customize, then choose your Gmail account, then select circles or categories. What setup page? Settings page? New account setup page? ART need more storage. And apps cannot be moved to SD card. Internal storage is used for app caching as well. So, if you only have 257mb free space in internal storage, you should not use ART runtime. Use Dalvik instead and move some apps to SD card. 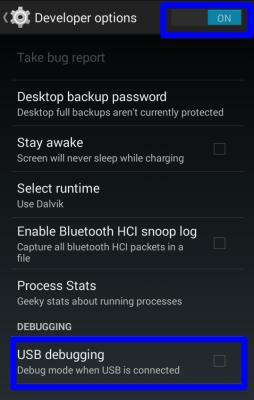 If you perform a factory data reset, then you should be able to change back to Dalvik. How to hide apps from my moto e screen. From home screen, you just tap and hold, then remove it. For app drawer, no, you cannot hide any apps. You may try some other launchers if you want to hide some apps. You can hide developer options by clearing data from Settings.You will find this options under Apps- All apps- Settings – Clear data.This will hide developer options. Use an USB cable. On your pc, you need install Motorola USB driver. No, enabling developer options would not create any problems. But if you change any settings inside improperly may create some problems. So, change settings inside developer options only when you know what you are doing. Is it charging when you connect the phone to the pc? If it’s charging, unplug it, reboot your Moto E. Then try again. I am unable to install apps. When I run the apk file window appears with cancel and install buttons but can’t go further from install button to installation. Please help me. If you tap install, it should pops out permissions or some warnings. it sounds like the apk file is not compatible with Moto E. Did you get the file from reliable sources? i have clicked as accessbility button and click on voicecall button. Then after my mobile is strucked. Please assist and help out my problem. and where i need to give that. Reboot your Moto E (press and hold power button until it reboots). Once it is rebooted, you can go to Settings–Accessibility–TalkBack, drag it to left to disable it. Not sure about what you want to achieve. It seems it has nothing to do with developer options. Hyperlinks normally is enabled automatically in most email client app (unless the mail is sent as text). first time I tried to connect moto e with pc by usb cable and it was run successfully but when I tried 2nd time to connect, I was unable. I gone through above steps, and activated developer options, clicked checkbox relation with USB debugging but still I’m unable to connect phone to pc by usb cable. Actually, you don’t need developers option of you must want to access /manage files on the phone. You may try to install the Motorola USB driver on your pc again. You may also disable usb debugging. If you want to install apps from other sources, you just need enable apps from unknown sources. Please do not install pirated apps for 2 reasons:1). It’s illegal; 2).they usually include malware and malicious code that may steal your private info. Did you notice anything strange, for example, too slow? The issue could be caused by some apps. It could also be caused by some hardware problems. If it’s caused by apps, you can try to backup your data and do a factory data reset. If it’s caused by hardware issues, you have to visit the device centre to check and fix it. I am unable to connect to pc. I have downloaded latest version. At last i got a message like NIF file failed. please assist. You may download the Motorola USB driver again. Please note the driver requires xp sp3 at least. its awesome!!!! !its working smoothly in my moto e.
When I connect my moto e to PC it gets connected and disconnected, a window asking to open the phone memory goes on blinking untill my phone is connected. I cant open my phone files on PC..Please help me, its urgent. You probably can re-install the Motorola USB driver. You may temporally disabke antivirus to test. You may also try it on another pc. You can add multiple Gmail account in one phone under settings – account. For Tamil, you can check the settings – language & input. Music files can all be moved to SD card Settings– storage –Move media. Wow! It’s an amazing tip. Thanks for your help. Now i cannot connect with even with MTP how i usually transfer before. You should not try to recover files yourself. If the files are important, you should backup them. Check with professional data recovery providers. when i am sending message to 121 it delivered fails to me…Could you please help me ? Is it need to change any settings for that? Thanks for your Quick Response.If we send any message to airtel Customer number (121) , it will ask us ” This may cause charges on your mobile account with Remember my choice ‘check box'”.Its working for my friend MOTO E mobile. but this option is not occuring on my MOTO E mobile and fail to delivered me. Remove the other sim card and try again if you have 2 sim cards inside. You can power off, then power on. If you press and hold the power button, it actually should reboot. I connected my moto e to my pc( windows 8.1) but nothing is happening.. Its not showin in my lap or chargin my cell. I switched on developer options and now all my apps, when clicked on, stop working suddenly. the camera, the contact list, messaging. and sometimes it says android core stopped working.!! help me with this. how do I make my phone alright? Unhide developer option should not change anything. Very likely, you turned on some settings wrongly. Uncheck the settings. I havent changed anything. Except this one time i clicked on show pointer location and then i set it back to normal almost immediately! 1) If i go to settings and click on clear data, will it clear out my messages, contacts and media? 2) What changes do i look for to undo in the developer options? 3) What were the factory settings in the developer options? ps: Would a factory reset help? 1. You need go to settings -apps – all- settings. clearing cache or clearing data will not affect your personal messages or emails. It only resets the app. 2. If you don’t know, you should not touch anything there. I guess you probably forget what you did. 3. Don’t touch anything in developer options unless you know what you are doing. There is a valid reason Google hides this by default. If you want to reset the phone (it will erase all your settings,apps and all your files in the internal storage, so backup thephone first), you can go to settings – backup and reset – factory data reset. It will give you a new phone. I called up customer care. they asked me to perform a clear cache partition. so i did. nothing changed. i’m back to square one. they said factory reset is the second solution. what guarantee do i have that my phone will be alright if i perform a reset when i dont even know what is causing my apps to stop working! If the factory data reset cannot solve the problem, you have to visit the service centre. You need backup your phone before resetting. First, you may try to check whether there are any system update for your phone at Settings–About phone –system update. Sometimes, it is caused by bugs that have been fixed. In addition, you may not need usb debugging. if the phone restarts for no reasons, you should visit the local service centre. First, do you really need developer options? Second, the method mentioned in the guide always work if you follow it. I cant move my music from internal storage to sd card, it shows in the misc/bluetooth. It isnt transfer by the move mediw function. How do i move it to sd card please help, only 260 mb of free space left in internal memory!! I can’t update my moto e .. Since its is launched in india. Is it is related to drvelope option.? What do you get Settings–About phone–software update ? Yes. I tried to reboot the phone when i had faced the same problem. But after rebooting also it shows sim card is disabled. Tell me a solution. You can power off the phone and re-insert the sim card. I have tried. But still the problem persists. if you are using two SIM cards, try one each time. My moto e mobile both sim options showing disable but sim is working tel me any solution for enbleling this..
ways. But it shows the same.that Both the sims are disabled. Not sure. You may visit local Motorola service center indicated in the warranty card to check the phone. I am using moto e.. I switched on developer option.. My sd card items are not visible.. Y? SD card problem is unlikely caused by developer options. What did you enable in developer options? 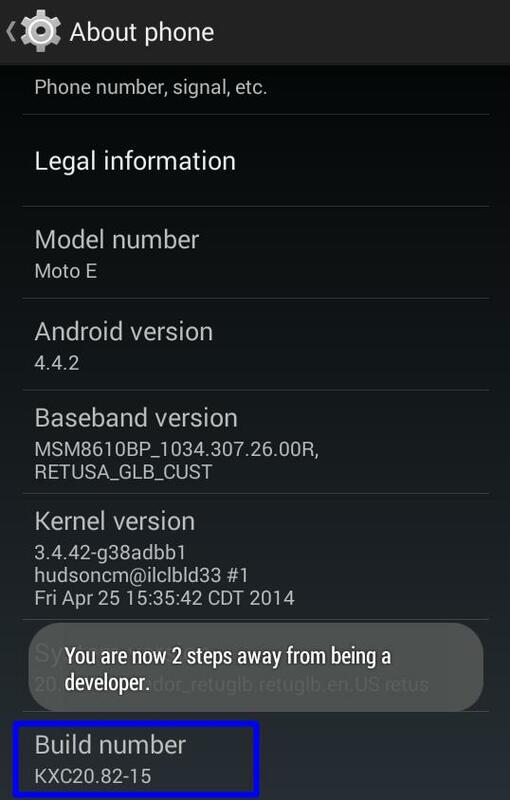 I have a moto e xt1521 4g 2nd gen. It has Marshmallow software. My device is locked it always ask for the email but i don’t remember that, apart from that i followed the instructions and open the settings but when i tap on build no to enable developer option but it does not show anything. Pls help. My email removed. I am not sure what you are talking about. Others can help you if you provide details. when i connected my motoe1 to laptop for first time it worked but after some days while i am connecting with usb cable it showed to options i clicked on first one at that time my charging is 1%.after sometime i noticed that the charging was not moving so i power off it and while trying to power on it is unable to switch on and showing 0% charging so i tried with phone charger to charge it but nothimg works can you help me to get out of this problem??????????????? You need to wait a few mins when charging the phone. Also, you should not charge the phone before battery dies. When battery level is lower than 15%, you actually get the reminder. Don’t drain battery completely often.